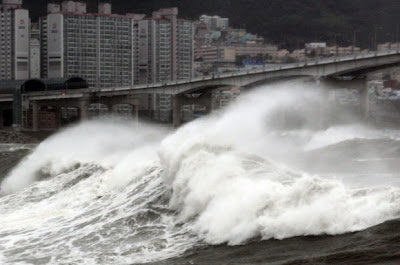 South Korean rescuers Wednesday recovered two more bodies near two wrecked Chinese fishing boats, bringing the confirmed death toll from a powerful typhoon to 18. Typhoon Bolaven -- the strongest to hit the South for almost a decade -- left a trail of death and damage in southwestern and south-central regions of the country. It drove two Chinese fishing ships aground early Tuesday off the southern island of Jeju, sparking a dramatic rescue operation. Coastguards wearing wetsuits struggled through high waves and pulled a total of 12 people to safety, and six swam ashore. Eight bodies had been recovered as of Wednesday and seven were still missing, the coastguard in Jeju said. Dozens of divers are involved in the ongoing search. The coastguard said in a statement it would make "utmost efforts" to account for all the missing. Most of the other deaths, confirmed by the public administration ministry, were caused by wind gusts that toppled walls or roofs or blew victims off their feet. Typhoon alerts covering most of the country were lifted as ferries and flights returned to normal and schools reopened. 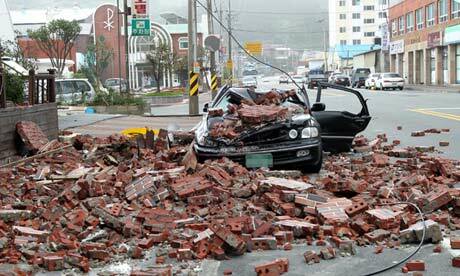 But South Korea is now on watch for another typhoon, Tembin. Bolaven moved on to North Korea, damaging crops and toppling some 3,700 roadside trees, the North's official news agency said. Human casualties were not reported. In North Hwanghae Province, the typhoon deactivated television relay facilities and destroyed or damaged some 20 houses and public buildings, the agency said, adding that "a lot of houses and roads" were submerged in other provinces. Bolaven crossed the Yalu border river into China early Wednesday. In South Korea, the typhoon was the strongest since 2003 in terms of wind speed. A maximum speed of 214 kilometres per hour (134 miles per hour) was recorded at Mount Mudeung in the southwestern city of Gwangju. Power cuts of five minutes or longer hit nearly two million homes, a record in the country, the public administration ministry said. The storm toppled nearly 8,000 trees and damaged 42 ships or boats and 35 houses. A total of 6,418 hectares (15,852 acres) of farmland was damaged. Typhoon Tembin, located about 350 kilometres northeast of the Taiwanese capital Taipei early Wednesday, is approaching South Korea at a speed of 20 kilometres an hour.